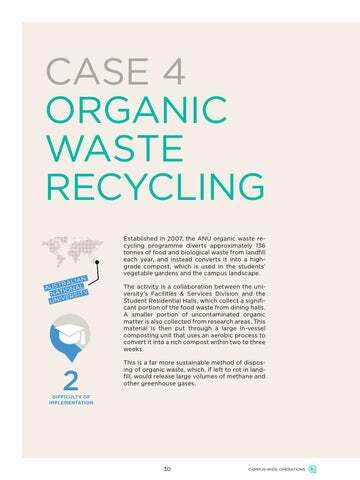 Established in 2007, the ANU organic waste recycling programme diverts approximately 136 tonnes of food and biological waste from landfill each year, and instead converts it into a highgrade compost, which is used in the students' vegetable gardens and the campus landscape. 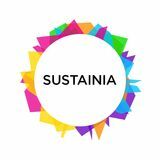 The activity is a collaboration between the university’s Facilities & Services Division and the Student Residential Halls, which collect a significant portion of the food waste from dining halls. A smaller portion of uncontaminated organic matter is also collected from research areas. This material is then put through a large in-vessel composting unit that uses an aerobic process to convert it into a rich compost within two to three weeks. This is a far more sustainable method of disposing of organic waste, which, if left to rot in landfill, would release large volumes of methane and other greenhouse gases.